27 Then he took a cup, and when he had given thanks, he gave it to them, saying, “Drink from it, all of you. 28 This is my blood of the covenant, which is poured out for many for the forgiveness of sins. I love celebrating Communion. I love the liturgy. I love the ritual of the sacrament, the tradition of it. I love that the words are the same as those I grew up with, even though I am in a different faith tradition now. I love that there is a deep sense of connection, not just to my own past, but a connection to the saints over the centuries, celebrating and worshiping as they did so long ago. I was able to help serve Communion just a few weeks ago in chapel. The following Sunday was Children’s Sunday at church and my oldest daughter was able to serve communion on that Sunday. It filled my heart with joy to watch her bless every person, offering them the elements. What a difference her life in the church will be compared to what I grew up knowing! She will be able to be a full participant in the celebration and worship, and I am thankful to know that will be a part of her future. As someone who grew up in a faith tradition where women were only allowed to be present at worship, but not allowed to do anything with the service, it brings me to tears to watch her joyfully serve. 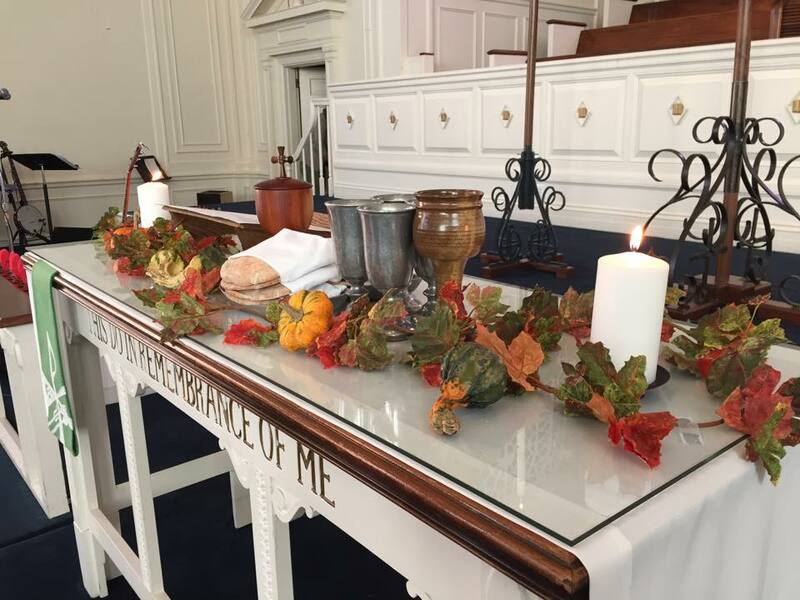 Communion is one of the elements of worship that I connect with on an emotional level. It brings a tangible presence to the service, and makes worship a more sensory experience. The taste of bread, the sweetness of the juice, the visceral connection to the heavens is what makes it such a beautiful experience for me. And it touches my soul deeply when I am able to offer the elements to others. I feel it is an intimate connection to the other to join with them in celebrating the Lord’s supper. Being able to remind another of the sacrifice of body and blood, given for them, given for me, is humbling and grace-filled. I have a hard time keeping it together, not crying as I am serving. I am honored to have that moment to connect with each person there, worshiping God together, offering our broken selves to the Lord, and accepting the grace and mercy that comes with the bread and juice. If you have never allowed yourself to fully immerse in the sense of awe and humility that Communion can offer, give yourself over to it the next time you are able to partake. Feel the presence of Spirit in that moment, allow yourself to connect to the Creator and the lover of your soul. Perhaps it may strike you anew the sacrifice made on your behalf. Perhaps you may be bowed low, awestruck with the realization of how much you…yes, you…are loved, abundantly. Loved to the point that God came down from the heavens, lived in this broken and hurting world, experienced shame, torture, and death, all to triumph over death and sin to restore His relationship with us, His people, His beloved. And me? I’ll be crying in corner, awestruck and humbled, too.